The problem is Amy’s bold curiosity which gets her in trouble from time to time. Does she ignore the odd things happening at the house across the street, like her neighbors do, or does she satisfy her curiosity at the expense of losing everything, including her life? Love thy neighbor does not exist on Amy’s new block! 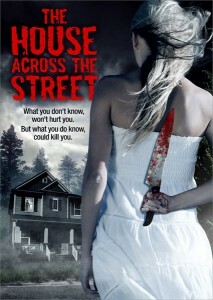 The House Across the Street is a gripping thriller that will keep you questioning what happened to Amy, which new neighbors are trustworthy, how mentally stable Amy is, and mostly what’s going on and who lives in the house across the street? Writer, Director, and Editor Arthur Luhn does an excellent job at keeping the audience engaged in the film. There are multiple sub-stories occurring that eventually tie in together, along with several twists and turns that keeps you guessing throughout the film. The tone of the film is dark as are the characters and their quirky and mysterious actions, all which is complimented by the tense music provided by Composer Munk Duane. Amy has a scarred past and her current life is complex and mysterious, but she’s courageous, determined, strong willed, and a bit paranoid and angry at times. Jessica Sonneborn obviously submerged herself into the role and mind of Amy and its evident when you watch her stellar performance in the movie. The rest of the cast includes quite a few familiar and well-known actors, Eric Roberts, Courtney Gains, Alex Rocco, and Josh Hammond just to name a few. When the movie opens, Amy is moving into her new rental home. Immediately she witnesses a woman screaming at the house across the street and while doing so becomes a victim of a hit and run. Amy finds out the woman is the mother of a girl that recently disappeared. From that point on the tone is set when the apparent friendly neighbors are a little too casual about the accident and Police Officer Peterson (Eric Roberts) makes it clear to Amy to mind her own business about the accident and in general. Eric Roberts did an excellent job as the cryptic cop trying to keep Amy from pursuing her curiosity about the woman and missing girl while keeping an eye on Amy. It’s not only the cul-de-sac she lives on, it’s everyone she encounters in the neighborhood and entire town that act strange. However, there are questions surrounding Amy’s mental stability when we find out she’s on anti-psychotics and she can’t get her prescription refilled. You know there is some sort of conspiracy going on in the town and while you try figuring things out, there’s always that question whether Amy is creating some of the madness in her own mind. Eventually Amy becomes friends with Police Officer Kyle (Josh Hammond), who can relate to her as he too is fairly new to the town. The more Amy investigates with the assistance of Officer Kyle, she pieces things together. When she accomplishes one of her goals regarding the missing girl, you think the mystery is over, but no, Amy isn’t done, and she digs deeper and breaks everything wide open. This puts her in more danger and makes Officer Peterson even more aggressive and all Amy’s apparent new friends are even more questionable by their actions. During the climatic scenes, the drama intensifies and the audience, just like Amy, still has a few remaining unanswered questions that she’ll get answers to no matter what it takes. When it all unravels, the “broken” Amy will take care of everything when she…..I can’t spoil it, you have to see it for yourself when The House Across the Street is available. It’s a must see highly intense thriller with a cast and story that keeps you engaged throughout.